From Tina Givens site: "Clara is gorgeous! 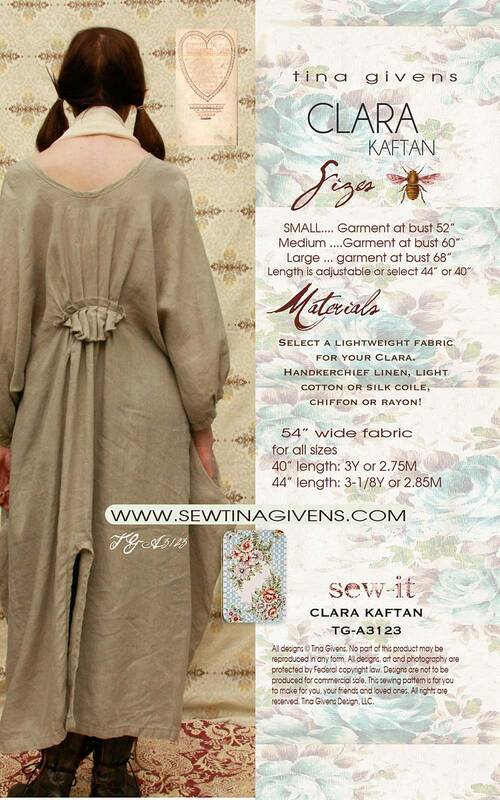 Make in lightweight linen for kaftan fun.... this is a beauty! I wear mine often, long or shorter it's perfect piece. I layer over Priscilla slip and even pants! Adore!" Kaftan has long sleeves, ruffle at back waist, side pockets and front and back slits. *** Please note: The package says the pattern sizes are S-L (4-18) but the pattern includes cutting lines for S, M, L, XL and 2X.